I’ve seen The 40 Year Old Virgin and know that there’s money to be had in those there action figures. 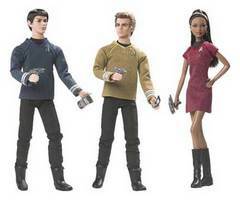 I’m determined to stock up on these new Star Trek figures, which are actually Mattel Barbie action dolls. I will, of course, be keeping them in their original packaging and ensuring they’re stored in a pure oxygen zero acid environment. And I will spend the next forty years plotting how I will spend the millions I will make on eBay, when I unleash those Star Trek babies. You can expect Captain Kirk, Spock and Lieutenant Uhura in April. which is a month before J.J Abram’s Star Trek hits the cinemas.